Born on 16 March 1774 at Donington, Lincolnshire, England. He studied at his local parish school and then at the Horbling Grammar School. He had been particularly interested in mathematics and navigation. Flinders joined the navy at the age of fifteen on the HMS Alert in October 1789 as lieutenant's servant. In 1791 he sailed with Captain Bligh on the Providence and later with Captain Hunter. 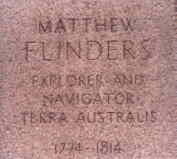 During the late 1790s Flinders sailed to Australia and established himself as a first class navigator, an excellent cartographer and a man of determination. In 1798 Flinders, John Thistle and George Bass sailed around Tasmania and proved it to be an island. The passage was later named Bass Strait and one of the islands Flinders Island. John Thistle had an island named after him at Cape Catastrophe where he drowned on 21 February 1802. Back in England in 1801, Flinders married Ann Chapelle in April. Ann was a descendant of a Norman Baronet who had helped sign the death warrant of Charles I of England in 1660. Flinders was placed in command of the Investigator to 'make a thorough survey of the Australian coastline'. Having married only three months before, he was expecting to take his wife with him but the Admiralty had different ideas. It was to be nine years before husband and wife would meet again. The ship left port, in the middle of the year on 18 July, with almost ninety sailors, including his brother Samuel, cousin John Franklin, artist William Westall, natural history painter Ferdinant Bauer, shipmaster John Thistle and naturalist Robert Brown. He was only twenty-seven and commanded a salary of £250 per annum. Cape Leeuwin was sighted on 7 December 1801. Flinders surveyed and charted the entire south coast from Cape Leeuwin and reached South Australian waters in January 1802 also charting the coast, islands, bays and headlands. On 27 January he reached the head of the Great Australian Bight and named a group of islands Pieter Nuyts Archipelago, after the Dutchman who had travelled on the Vergulde Zeepaard which sighted it in 1627. Flinders also named many features after members of his crew and Admiralty. Obtaining fresh food and water were some of his biggest problems and on one occasion eight members of his crew drowned when their boat sank while trying to search for fresh water. He named the site Cape Catastrophe and Memory Cove. A large island was named Thistle's Island, after the ship's master and one of the eight drowned. From here Flinders sailed north into a gulf, which he named Spencer Gulf, and hoped that it would lead him well inland or even to the Gulf of Carpentaria. When sailing into the next gulf he came past the site where thirty-five years later Adelaide would be established, and found that there was no strait dividing New Holland and New South Wales. After returning to Kangaroo Island for more supplies he sailed eastwards through Backstairs Passage into Encounter Bay where he met a French ship under command of Nicolas Baudin on 8 April. Baudin named many bays and other landmarks, including Guichen Bay. From recent research, undertaken by Paul Mazourek, Whyalla Maritime Museum curator, it appears that Baudin never went any further than the Moonta area. This was done by Captain Louis Claude de Saulces de Freycinet and geographical surveyor Boullanger. On 10 January 1803 they were instructed by Baudin, at Kangaroo Island, to proceed north in the Casuarina and explore the western coasts of the two gulfs. It were Freycinet's maps, printed in 1804, that first showed the Upper Spencer Gulf area to the Europeans, and not those of Flinders. In Sydney he learned of his father's death and his wife's serious illness. After two months he finally set sail for England but was shipwrecked on the Great Barrier Reef. After rowing back to Sydney he sailed back in October, in company of two other ships, and picked up all survivors, including his brother. Most of the survivors went to China to wait for transport home but Flinders went on in the Cumberland with all his books, journals, maps and the latest mail from Australia for England. They went via Timor where they got some fresh supplies before continuing their trip. With the Cumberland rapidly deteriorating, Flinders was forced to call in at Mauritius (Ile de France) for repairs, unaware that Britain and France were at war. He was interned by the French authorities and kept a prisoner for six and a half years. As time went on Flinders was moved from goal and confined to the private residence of Madame D'Arifat and her daughter Delphine. He was finally released from his imprisonment in June 1810 and arrived back in England in October. In very poor health and with little assistance from the government and even less pay he started to write his massive narrative, A Voyage to Terra Australis. In April 1812 Matthew and Ann had a daughter, Anne. She would never remember her father. Flinders' health continued to decline and he died on 19 July 1814, the day after the publication of his books and maps. He was buried at St James, Hampstead. 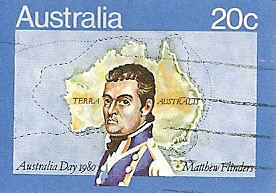 Ten years after his death Matthew Flinders' widow and daughter were voted a pension by the Government of New South Wales. 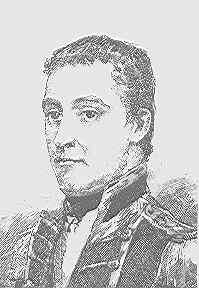 It arrived too late for his widow, who had already died, but his daughter Anna announced that she would use the money for the education of her son Matthew Flinders Petrie. He went on to become Sir Flinders Petrie, one of the earliest and most prolific Egyptologist. In 1893 Edwin Hodder's A History of South Australia was published in London. Naturally Hodder recounted Flinders' voyage in some detail.